Winemaking often seems like a journey. Sometimes it is a walk down suburban sidewalks, sometimes it is a safari in a wild jungle, and sometimes it is the challenging passage down the gritty streets of a big city. No matter how your winemaking journey goes, think of The Beverage People as your outfitter: we make sure you have everything you need for an enjoyable and rewarding trip. One way to think of that trip is to divide it into stages. Grape handling and primary fermentation get you started, aging in bulk in the cellar fills out the middle part (known as élevage, if your journey is in French), and getting the wine adjusted for bottling finishes things up. In 2011, we introduced a new group of professional grade products, focusing on the beginning and end of the journey. Those enzymes, tannins, and specialized yeast nutrients have been very successful and we are delighted to continue offering them. After using these products in our own wines, we realized that we were missing a few opportunities. For some wines, particularly whites for malolactic fermentation, we could improve the launch. In that middle part—the élevage or cellaring—we could offer some new enhancements for many wines. Finally, we recognized that our wines were sometimes going to the finish without the final touch that could raise a good wine to a great wine. With those opportunities in mind, we proudly introduced another new group of wine enhancement products in 2013. In the descriptions below, you will find products to help malolactic fermentation, contribute progress in cellaring, and achieve a better finish. Check these out before you launch your next wine safari! Opti ML Blanc. Malolactic fermentation in Chardonnay is often the most difficult to finish. Lallemand has formulated this new yeast-based product for the specific peptide needs of white and rosé wines. Improved bioavailability of needed components stimulates the growth of selected malolactic bacteria, shortening the duration of ML fermentation and assisting completion. Use Rate: 20 g/hL or a bit less than 1 gram per gallon. How to Use: Mix the desired amount of Opti ML Blanc into a small amount of water or wine and add to the wine 24 hours before adding your malolactic bacteria culture. We have been offering sacrificial tannins to help get a great start: FT Rouge Soft and FT Blanc Soft. We have also been offering Tannin Riche for the finishing stages of wine in need of a bit more mouthfeel, oak character, or richness. We had the tannins covered for the beginning and the end. We are now outfitting the middle of the transit with an exciting new pair of tannin products. Tannin Complex. For Red Wines. 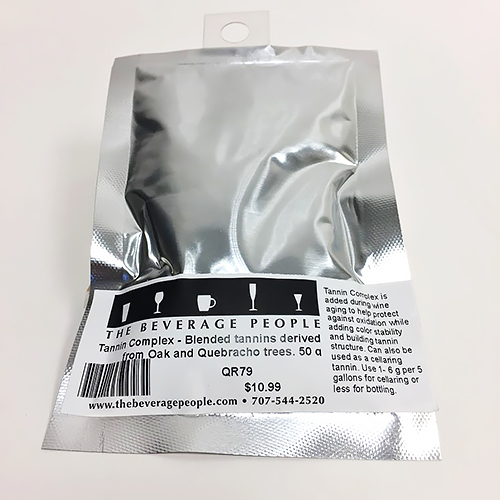 Derived from both traditional oak and the exotic South American tree Quebracho, this blend is more thoroughly polymerized (and therefore less reactive) than more aggressive tannin products. During wine aging, it helps protect against oxidation while enhancing tannin structure and aiding color stability. After cellaring is mostly complete, it can further be applied (like Tannin Riche) as a finishing tannin three to six weeks before bottling. Use Rate: 1 to 6 grams for every 5 gallons of wine for cellaring; use a reduced rate closer to bottling (about ½ to 2 grams for every 5 gallons). How to Use: For best integration with the wine, apply in the cellar. At the first or second racking after primary fermentation, mix the powder into the wine as you transfer it. For finishing, add during another racking a few weeks prior to bottling. Thorough mixing will improve results. Tannin Refresh. For White, Rosé, and Red Wines. This unique tannin product is derived from untoasted French oak. Because of its origin and method of production, it imparts a light oak nuance without smoky or toasty character. It can be used when wine is aged in older neutral barrels or in tanks or carboys. It is effective in protecting against oxidation and it also helps preserve color when present. In any wine, it can increase the complexity of the finish. Use Rate: ½ to 4 grams for every 5 gallons of wine. How to Use: If the wine is to undergo malolactic fermentation, wait until that is over before adding Tannin Refresh. If malolactic fermentation is not applied, add the tannin at the end of alcoholic fermentation. Mix measured dose gradually with the wine during the first racking . Continue with a normal cellaring and racking program for the rest of the aging period. You may get close to bottling time and find that a wine has a swampy stink or a burn of alcohol heat. Or maybe the wine is adequate, but would benefit from a touch of sweetness. Maybe you even have experience with a white or rosé that, in previous vintages, has thrown some sediment in the bottle. Bring those wines to a stronger, safer conclusion with these new products. For many years, we have offered copper sulfate solution to assist in removing reduced-sulfur aromas from Hydrogen Sulfide (H2S) and Dimethyl Sulfide in funky or swampy-smelling wines. At times, there has been concern about residual copper levels in the wine if the dose is not carefully measured or if more than one treatment is required. Now Reduless, combining yeast hulls with copper, provides a self-removing treatment for these sulfur odors. The product is OMRI certified organic and provides a simple treatment process for funky, reduced wines. Use Rate: 10-15 g/hL or 0.4 to 0.6 g per gallon. How to Use: Mix Reduless in 10 times its weight in water (that is, use 10 mL of water for every gram of Reduless you will be adding to your wine). Mix gently and add immediately to the wine. Stir the wine gently, allow to settle, and rack off in 72 hours. The problem (and the Reduless residue) will be left behind. This is another yeast-derived product that can be used alone or combined with Reduless. Besides acting to clear up the reduced sulfur aromas, it can also reduce aggressive character or the burning sensations caused by high alcohol levels or fruit defects. Immediate improvement may occur and action may continue over a period of three to five months. Use Rate: 30 g/hL or about 1 gram per gallon. How to Use: Mix in 10 times its weight of water (use 10 mL of water for every gram of Noblesse you will add to the wine). Add during mixing or racking. The product is partially soluble, so stir the wine to assure good contact. Flashgum R Liquide. For White and Rosé wines. Gum Arabic (the basis for flashgum) is a natural product harvested from Acacia trees. With a long history of assisting with wine quality and stability, it is now available to home winemakers in this easy-to-use 25% solution. 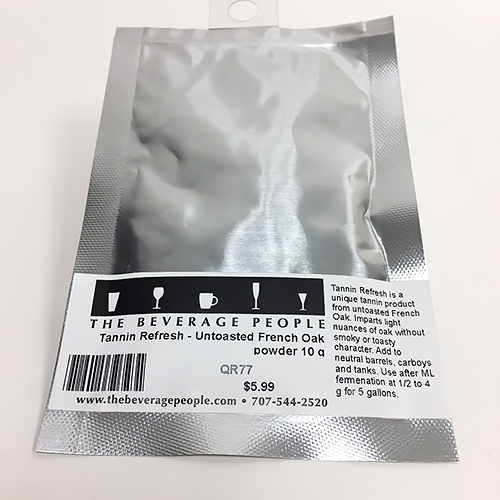 It helps prevent colloid precipitation and cloudiness in light-colored wines, reduces astringency, provides a fuller mouthfeel, and imparts and impression of sweetness (without the instability of sugar additions). Use Rate: 40 to 132 mL/hL or 1.5 to 5 mL per gallon. (TTB commercial legal maximum is 87 mL/hL or 3.3 mL per gallon). How to Use: This should be the last product added to the wine before bottling. Since it may interfere with filtration, wine to be filtered before bottling should have trials done before treating the whole batch. If not filtering, add Flashgum R prior to bottling. We offer a group of wine enhancement products to help malolactic fermentation, contribute progress in cellaring, and achieve a better finish. Here are specific instructions in their use.